Officially licensed by Major League Baseball. If you select the photo version please email your photo to invitations@thatsmyticket.com after checking out. Please include your order number in the subject line (Example: Ticket Invitation Photo Order TMT12345) For best results please make sure your photo is 300dpi or better and that the photo will fit into the design, accounting for the team logo that will cover part of the photo. Having a birthday party for a Padres fan? How better to show that fan's love of the game than with a party invitation that looks like a ticket! 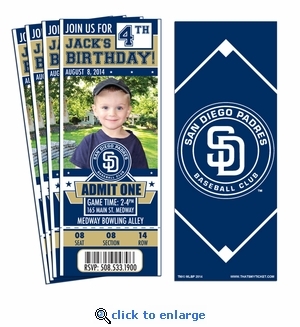 Our invitations are created to look just like a ball park ticket but include all of the important information to get your guests to the party. Gotta great photo? We can add that too! ($8.00 additional). Each ticket invitation measures 3.5 x 8.5, is printed on 100lb cardstock, features full color logo'd back and includes envelopes. If you select the photo version please email your photo to invitations@thatsmyticket.com after checking out. Please include your order number in the subject line (Example: Ticket Invitation Photo Order TMT12345) For best results please make sure your photo is 300dpi or better and that the photo will fit into the design, accounting for the team logo that will cover part of the photo.